With this post, we begin our new Podcast section, which will be added to on a regular basis. These will be talks on meditation, practical aspects of spiritual life, memories of remarkable spiritual figures Abbot George has met, and much more. During his first trip to India in 1962 Abbot George Burke was blessed to spend time with the great Swami Sivananda at his ashram in Rishikesh. 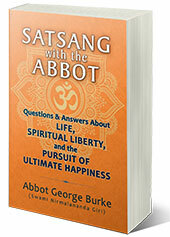 In this three-part podcast Abbot George shares his memories of this saint with visitors to our ashram. Episode length: 12 minutes, 18 seconds. (If you don’t see an audio player, click this link to listen to Remembering Sivananda, Part 1. Listen to the second podcast in this series, Remembering Sivananda, Part 2. May a Christian Believe in Reincarnation? This site presents the path of meditation and practical spiritual life and is a service of Light of the Spirit Monastery (Atma Jyoti Ashram), which is located in Cedar Crest, New Mexico, USA. Original Christianity is the fundamental teachings of Sanatana Dharma, the Eternal Dharma, which were taught by Jesus, who was a missionary to the West of the spiritual vision of India. Original Yoga is the practice of Soham Yoga, divinely revealed to Matsyendranath, founder of the Nath Yogi Sampradaya, of which both Patanjali and Jesus (Sri Ishanath) were members. What Is Life on the Astral Plane Like?